After one week in "Oh, the Places You'll Go!” there will never be another place for your family's Sandbridge Beach vacation! Fabulous semi-oceanfront home with private pool, hot tub, rec room with pool table and an elevator that accesses all three levels. There is plenty of deck space on the mid and top levels to enjoy ocean views and ocean breezes. Interiors are professionally furnished with high end appointments for your discriminating taste. Access to decks on both sides offer sunrises and sunsets, or just relax inside enjoying the LCD TV. The electric fireplace exudes ambiance in the off-season, and the kitchen will thrill you. Outfitted specifically for large family groups, there are granite countertops, all stainless steel appliances (two stainless steel stoves for a total of 8 burners and 2 griddles, 2 ovens, 2 oversized refrigerators) and plenty of storage space. There are seven master suites for your group, and 2 king master suites have jetted tubs! All kids, young and old, will spend most of their time on the ground level rec room with full size pool table, game table, kitchenette with mini fridge, microwave, sink, and dishwasher. Enjoy the game on the LCD TV while you hang out and play pool. Patio access to the pool deck area is off the rec room but gated for additional security for families with young children. The hot tub is on this patio but still poolside so adults can relax while the kids splash in the pool. The poolside cabana bar adds more fun in the sun and offers a full size refrigerator and bar seating for grilling by the pool or happy hour. After all, it's 5 o'clock somewhere! Top-Level: Great Room with LCD TV, DVD, Electric Fireplace, Kitchen with Granite, 2 Stainless Steel Gas Stovetops with griddles, 2 Stainless Steel Dishwashers, 2 oversized Stainless Steel Refrigerators over Freezers, Bar seats 3, Dining Table seats 12, Dining Table seats 8, Deck Access, Half Bathroom, King Master with LCD TV, Whirlpool, and Shower; King Master with LCD TV and Shower. Mid-Level: Master Bedroom with a Double Bunk Bed and a Twin Bunk Bed, with LCD TV and Deck Access; King Master with LCD TV, Jetted Tub/Shower with Tile, and Deck Access; King Master with LCD TV, Tile Shower, and Deck Access with Ocean View; Queen Master with LCD TV, Roll in shower, Roll Under Sink, and Deck Access; Laundry with 2 Washers, 2 Dryers (Full Size Stackable). After one week in "Oh, the Places You'll Go!” there will never be another place for your family's Sandbridge Beach vacation! Fabulous semi-oceanfront home with private pool, hot tub, rec room with pool table and an elevator that accesses all three levels. There is plenty of deck space on the mid and top levels to enjoy ocean views and ocean breezes. Interiors are professionally furnished with high end appointments for your discriminating taste. Access to decks on both sides offer sunrises and sunsets, or just relax inside enjoying the LCD TV. The electric fireplace exudes ambiance in the off-season, and the kitchen will thrill you. Outfitted specifically for large family groups, there are granite countertops, all stainless steel appliances (two stainless steel stoves for a total of 8 burners and 2 griddles, 2 ovens, 2 oversized refrigerators) and plenty of storage space. There are seven master suites for your group, and 2 king master suites have jetted tubs! All kids, young and old, will spend most of their time on the ground level rec room with full size pool table, game table, kitchenette with mini fridge, microwave, sink, and dishwasher. Enjoy the game on the LCD TV while you hang out and play pool. Patio access to the pool deck area is off the rec room but gated for additional security for families with young children. The hot tub is on this patio but still poolside so adults can relax while the kids splash in the pool. The poolside cabana bar adds more fun in the sun and offers a full size refrigerator and bar seating for grilling by the pool or happy hour. After all, it's 5 o'clock somewhere! Top-Level: Great Room with LCD TV, DVD, Electric Fireplace, Kitchen with Granite, 2 Stainless Steel Gas Stovetops with griddles, 2 Stainless Steel Dishwashers, 2 oversized Stainless Steel Refrigerators over Freezers, Bar seats 3, Dining Table seats 12, Dining Table seats 8, Deck Access, Half Bathroom, King Master with LCD TV, Whirlpool, and Shower; King Master with LCD TV and Shower. Mid-Level: Master Bedroom with a Double Bunk Bed and a Twin Bunk Bed, with LCD TV and Deck Access; King Master with LCD TV, Jetted Tub/Shower with Tile, and Deck Access; King Master with LCD TV, Tile Shower, and Deck Access with Ocean View; Queen Master with LCD TV, Roll in shower, Roll Under Sink, and Deck Access; Laundry with 2 Washers, 2 Dryers (Full Size Stackable). Ground-Level: Rec Room with Full Size Pool Table, Game Table seats 5, 48” LCD TV, Kitchenette with Bar seats 5, Mini-Fridge, Dishwasher, Microwave, and Sink, Access to Patio leading to Pool Deck, King Master with LCD TV, and Shower with Seat; Bedroom with a Double Bunk Bed and a Twin Bunk Bed with LCD TV; King Bedroom with LCD TV, shares access to Hall Bathroom Extras: Private Pool (11 x 22), Hot Tub (6), Elevator, Wireless Internet Access, Full Size Pool Table, 2 Gas Stoves with Griddles, 3 Dishwashers, 3 Full Size Refrigerators, 2 Microwaves, Gas Grill, No Smoking, PETS NOT ALLOWED, Parking: 9 Cars, Distance to the Beach: 56 ft Additional amenity details: Private pools are open from May 3, 2019 until October 6, 2019. This property is not equipped for pool heat. Pool heat is not an option for this property. Hot tubs are available from March through December. 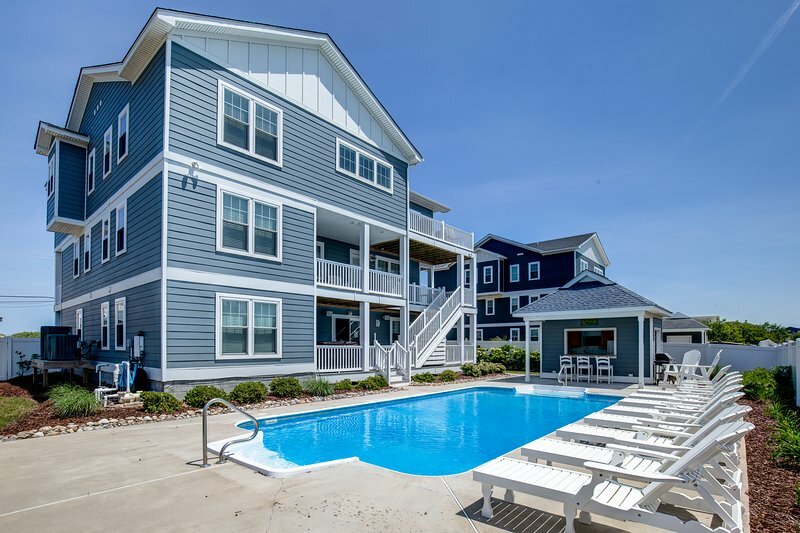 All Sandbridge Blue properties provide bed linens, bath towels, beds made prior to your arrival, and a starter supply of: toilet paper, bathroom soap, paper towels, and dishwater detergent.